Megan matriculated in the Eastern Cape in 2007, where after she obtained a diploma in Health and Skincare in Port Elizabeth in 2009. 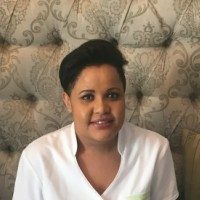 Upon completion of her studies, she worked in St Francis, Hermanus and Jeffreys Bay gaining valuable experience as a medical aesthetic therapist. In February 2017, she got married and then moved to Cape Town where she worked as a spa therapist in Somerset West for a few months. She was then granted the opportunity to join the Renewal Institute family. She is very excited to be part of this innovative company and is eager to share her passion for aesthetics. She is a firm believer in equipping herself with relevant knowledge, to ensure a high level of service.